With a traditional look, these cannons with their stainless steel barrels really shine during competition or fun. Available cannon sizes in 12", 15" and 18" barrels. What to intensify the look of your cannon? Choose a carbon wrapped barrel in black, red or graphite. Available cannon sizes in 12", 15" and 18" barrels. For those who have a statement to make, choose a cannon from our signature series in either flame design or vented look. Available cannon sizes in 18" barrels only. Receiver choices of stainless steel or black. 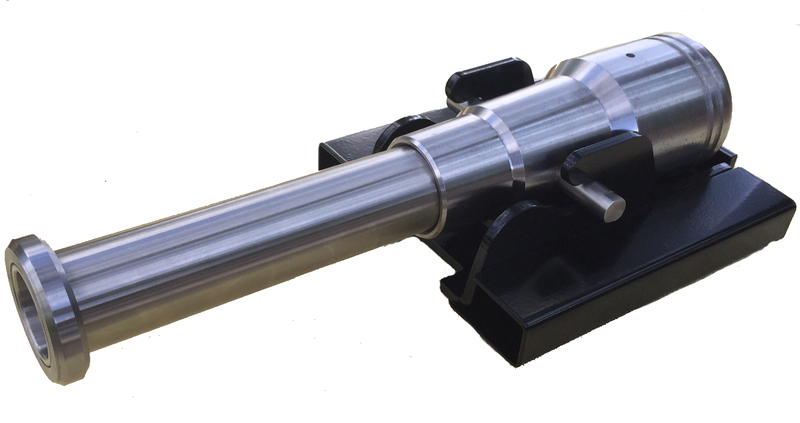 Our Smallest and Loudest Black Powder cannon, Boomer will not shoot golf balls but will surely bring you a big bang for your buck. Really want to stand out? Have your own logo or custom design you want tattooed on your custom cannon? Choose your barrel size, receiver color, customize your order any way you want for a truly unique cannon.